Society today is split in two. On the one side, there are those who embrace innovation and digitization. On the other, there are the “digital losers” who don’t see the point or are actively hostile to technological progress. They’re skeptical of using new cloud, mobile and smart technologies and they may even fear their jobs will one day be usurped by machines. Yet technology can help to truly transform and improve society. We just have to see it as a medium for change rather than the end goal in itself. Industry and governments must therefore improve development and access to disruptive technologies which could create a newer, better society. But they also need to sell it better to the citizens it could benefit most. Unfortunately, many of us fear digital change. There’s a growing fear that AI-powered automation will lead to mass redundancies. Even McKinsey has judged that up to 800 million jobs will go by 2030. To an extent, a conservative education system reinforces these prejudices, failing to teach pupils about the miraculous possibilities technological advancement offers. Think about smart healthcare and education, smart cities and even governments. Together they could form the nucleus of a safer, happier, more productive, inclusive and environmentally friendly society: a “Society 5.0” like the kind currently being developed in Japan. In the Far East, they’re already building a secure, empowering, innovative environment where all citizens can participate. To build this kind of new reality, we need the right infrastructure in place, and we’ll need to refresh the education system with a digital focus. But cybersecurity will also feature heavily. National-scale transformation projects like this will only work if they’re founded on resilient, secure architecture. Users must have trust in the infrastructure, and they must have control over their own data. This is where we’ve already taken giant strides in Europe with the General Data Protection Regulation (GDPR). Compliance may be expensive for firms, but as a means to enforce this user-centric model, and improve accountability and transparency in data use and protection, it’s a far-sighted and world-leading piece of legislation. Yet even if you build it, they won’t come unless they believe it delivers value for them. Businesses and governments will only win over those skeptics if we stop talking about technology without context and start to frame the discussion around societal change enabled by technology. 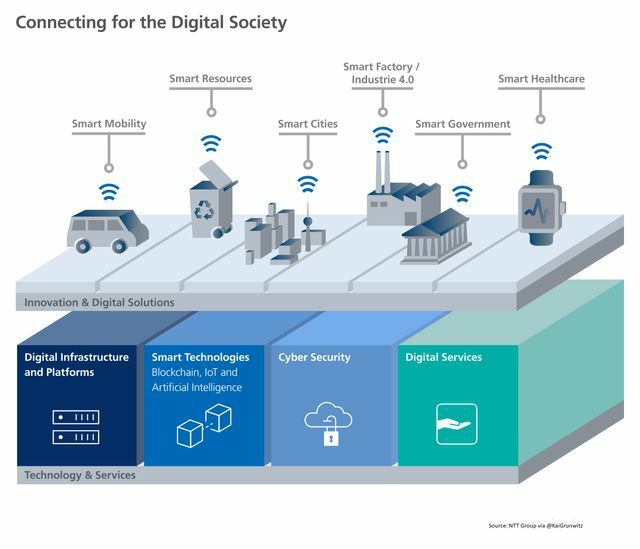 In short, we need to talk about Society 5.0 rather than Industry 4.0. The first step is building the right political, economic and moral frameworks. NTT Security is already working with government in this area. Most normal people don’t care about IT, they just want to know how it’s going to benefit their lives. So we need to be more persuasive in how we communicate. Privacy and security will play a key part in this messaging. For example, say you want patient approval to access healthcare records for a DNA mapping project. Many may refuse on privacy grounds. But assure them it will be done anonymously and could ultimately lead to longer life expectancy, by enabling doctors to spot hereditary diseases and early warning signs more effectively, and you’ll start to get buy-in. These are early days still, but it’s important we start off on the right foot. Technology is here to serve society, not the other way around. So let’s start treating it as such.